Machine tools industry has evolved significantly over the years, with developments in both hardware technologies and related software applications. Going ahead, as the developments in software applications are poised to outpace developments in hardware performance machine tool OEMs are turning to software solutions to gain a competitive advantage. Software can enable advanced features in machining systems like higher precision machining to handle growing miniaturization, ability to handle different materials that include glass and ceramics and for niche segments like medical devices. Software can also bring in differentiation through programming productivity ease-of–use, and a future ready sustainable product architecture that draws on the latest advances in information and communications technology. STEM Xpert’s services enable machine tool OEMs to introduce advanced capabilities through software solutions that complement their hardware systems. 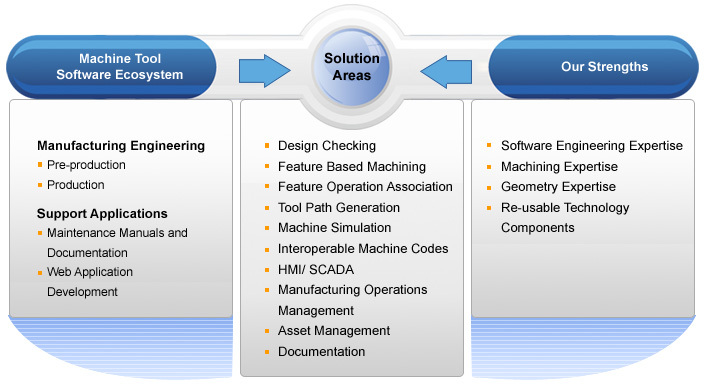 We help machine tool OEMs meet their increasing demands for sophistication in geometry and design data handling, simulation, tool path generation, production management and documentation. STEM Xpert offers full lifecycle services starting from the concept through development to technical support and maintenance of the software. We deliver value on existing software applications through our re-platforming services like porting applications to 64 bit environments, migrating to the latest GUI technologies, standardization of multiple software products to a single scalable platform, as well as ensuring interoperability with leading CAD, CAM and quality management applications. Re-usable Technologies and Products for Machine Tool STEM Xpert has a set of re-usable technology components that can be leveraged to meet the software challenges faced by machine tool OEMs and reduce the software development lifecycle time.